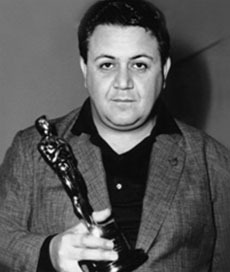 In 1960, the motion picture Never on Sunday (Ποτέ την Κυριακή) made international headlines and attracted many awards and nominations. 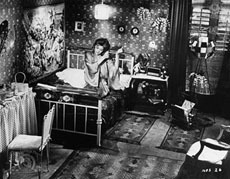 According to the credits, the associate producer was Vassili Lambiris, and it was written and directed by Jules Dassin. 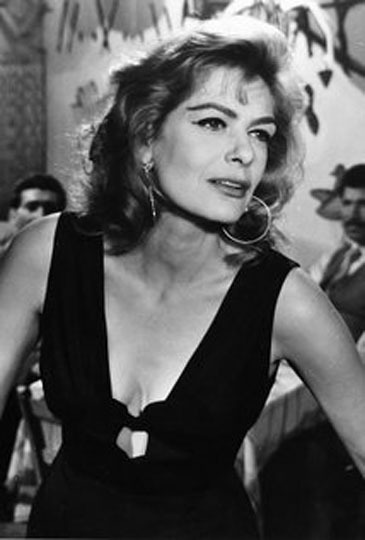 The film featured the beautiful Greek actress Maria Amalia Mercouri, whose stage name was Melina Merkouri. For her work in this film, Merkouri received the Best Actress award at the Cannes festival in 1960. In this movie, she sang, "Ta Pedia Tou Pirea" ("Τα Παιδία Του Πειραιά"), the song which received worldwide recognition, including an Academy Award in 1960 for Original Music, Best Song. Later, this song also became known as "Never on Sunday". ABOUT THE PHOTO: Manos Hatzidakis, the composer of this song, was not able to travel to the Academy Award ceremony to receive his Oscar in person. Actress Katina Paxinou borrowed an Oscar statuette for him to pose with while waiting for his own award to be shipped to Greece. The song title "Ta Pedia Tou Pirea" translates to "The Guys of Pireas". Pireas is an international port city within Athens (not to be confused with downtown Athens). Merkouri's character was a lady of the evening, and in the song she sings about the men who are out late at night in the port city of Pirea. ABOUT THE PHOTO: This is the scene from the motion picture Never on Sunday in which Melina Merkouri sings "Ta Pedia Tou Pirea". 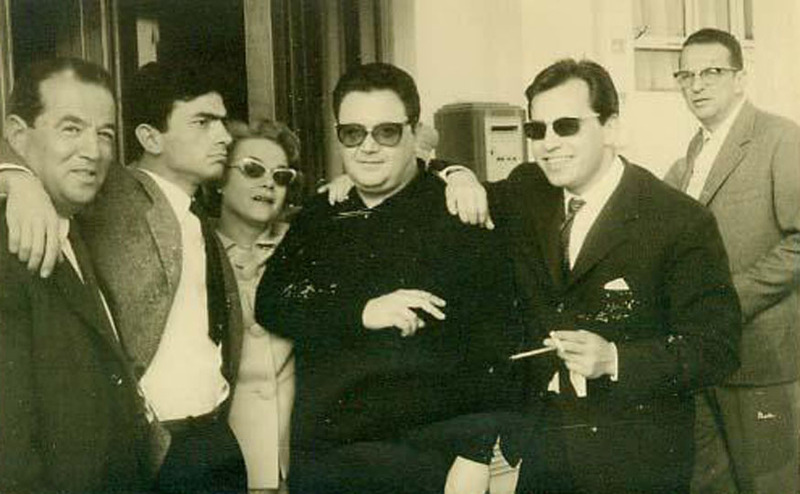 ABOUT THE PHOTO: Kostas Seitanidis (bass player), Giorgos Emirzas, Despina Diamantidou (one of the actresses in Never on Sunday), Manos Hatzidakis (the composer of "Ta Pedia Tou Pirea" and winner of the 1960 Oscar for it), Gerasimos Lavranos in Cannes. Following the success of the motion picture and its hit song, many artists worldwide released their own versions of the song. 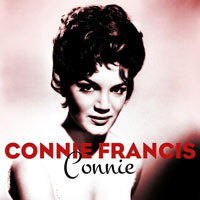 Many of these versions were released under the song title "Never on Sunday", rather than maintaining the original Greek title for the song. Billy Towne wrote English lyrics whose meaning were entirely different from the original Greek. 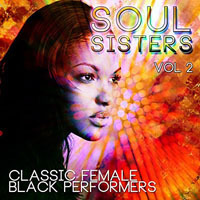 The song has been recorded by Petula Clark, Eartha Kitt, Connie Francis, polka bands, steel drum bands, big bands, orchestras, and many other genres of artists. 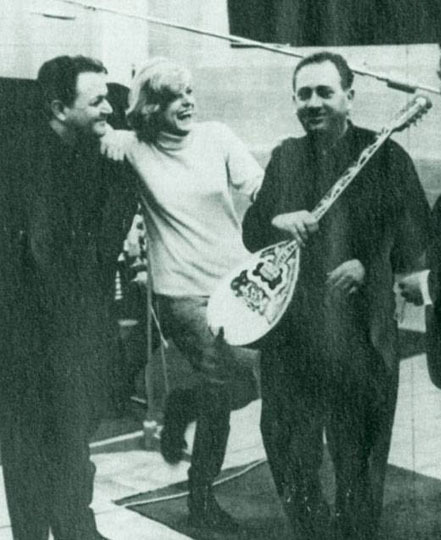 According to rumor, the legendary composer Manos Hadzidakis, wrote the lyrics while riding in a car with Giorgos Zabetas on their way to the studio! Although Manos Hadzidakis won an Oscar for his song, he did not make much money from it. Unfortunately, stories like this were far too common back then. ABOUT THE PHOTO: This photo shows, from left to right, Manos Hadzidakis, Melina Merkouri, and Giorgos Zabetas. Few people outside of Greece have heard of Giorgos Zabetas or his relationship to this song. Giorgos Zabetas is another legendary composer and singer. Zabetas was also an incredibly talented Bouzouki player. One evening Merkouris, Dassin and Hadzidakis gathered together for an evening out on the town to see Zabetas playing live. At this point this world renowned song had been created on piano. Giorgos Zabetas is credited for adding the bouzouki portion of the song. ABOUT THE PHOTO: Three men are doing a Greek line dance. From left to right, they are: Giorgos Provias, Giorgos Zabetas, and Dimos Abazolglou. Giorgos Provias was the choreographer for Never on Sunday, and some credit him with inventing the Greek dance style known as sirtaki. 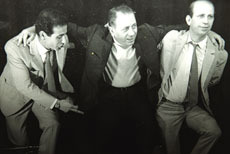 Giorgos Zabetas was the composer of the bouzouki instrumentals in "Ta Pedia Tou Pirea".Dimos Abazolglou was one of the three renowned dancers mentioned below. In the 1960's, both Greek movies Zorba the Greek and Never on Sunday enjoyed great success and international recognition. Unfortunately, the musicians did not make much money. The fate of Melina Merkouri was unexpected. Melina found love in the arms of her second husband, Jules Dassin, but lost her first love.... Greece. Born into a family of politicians, it was understandablel that she would be extremely outspoken and againt the dictatorship junta (1967-1974). Her political stance threatened her future in Greece, leading to the loss of her Greek citizenship. 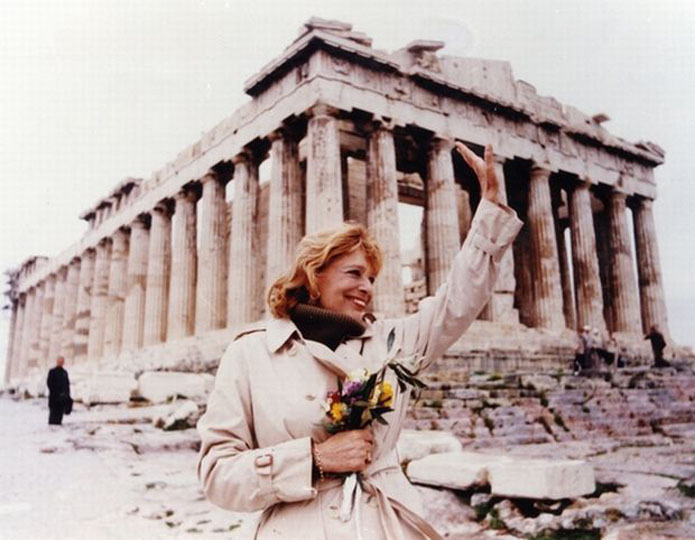 After the fall of the military junta in 1974, Melina returned to her country and embarked on an exhausting journey to help rebuild and protect the Hellenic culture. 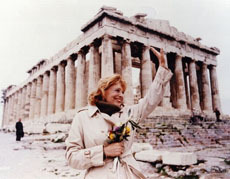 She is remembered for many great things including her fight against the British museum to return our Greek Elgin marbles, which were stripped from the Parthenon, back to Greece... something which has yet to happen. Έρχεται ο Μερκούρης ο Σπύρος, και μου λέει ξέρεις τι γίνεται, σε θέλη ο Μανώλης ο Χατζιδάκις. πηγαίνοντας εκεί μου λέει ο Μανώλης έλα εδώ κάτσε να ακούσεις μου λέει ένα μοτίβο. Κάθομαι, να πούμε, και αρχινάει και μου παίζει την εισαγωγή απ’ Τα Παίδια Του Πειραιά. Εγώ την ψώνησα. Λέω, βρε Μανώλη του λέω για ξανά παίχτω. Το ξανά παίζει. Τσιμπάω το Βουζούκη, το πέρασα, εντάξη ήτανε. Του λέω Μανώλη εδώ βλέπω εκατομμύρια δίσκοι, του λέω. Spyros Merkouris comes, and says to me, you know whats going on, Manos Hadjidakis wants to see you. On our way there, Manos tells me, "Come sit here to listen." He tells me of a composition/motif. I sit, ya know, and he starts playing the introduction from "The Boys/Men of Pireas". I went crazy. I said, "Hey Manoli," I said, "play it again." He plays it again. I picked up the Bouzouki, and I played it. It was okay. I said "Manos, here I see millions of record albums," I told him. Που λές Κάννες, ιστορία, έχουμε τελειώσει το φίλμ, δεξίωση, όλη μεγιστάνες, της κονόμας, του πρές, του κινηματογράφου, του Θεάτρου. Έχουν μαζευτεί, και εμέις έχουμε δόση ψυχούλα. Ψυχούλα μέχρι να φτάσουμε εκεί. Με έχει πιάσει και εμένα το πατριωτικό μου κάργα και λέο….τώρα μπαγάσιδες θα σας πάρω τους κονδυλοφόρους και άυριο θα γίνει της τρελής. My crazy patriotism came over me immediately and I said, "Now you cool sneaky/tricky guys, I will take those who have been paid off and tomorrow it will be a crazy (fun) time. " Tycoons are mega rich, big shots. In Greek we say, "mou evgales ti psihi". This means you took the soul out of me. It took all Hadzidakis' and Zabetas' souls/energy to reach their destinations. Not an easy journey. Zabetas is explaining that the French finished their party/celebration early in comparison to the Greeks, who partied until 7:30 a.m.! He starts to play Bouzouki to the tune of Ta Pedia Tou Pirea. 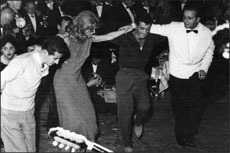 Some other notable Greek artists present at this event were actor Giorgo Founda (appeared in Never on Sunday), actress Despina Diamantidou (appeared in Never on Sunday), pianist Yerasimo Lavrano, bass player Kosta Seitanidi, singer Tolis Harmas of Duo Harmas and composer/drummer Nikos Lavrano. Last, but definitely not least, there were three very special and talented men who were considered to be some of Athens' finest dancers: Dimos Abatzoglou, Theodoros Kalpaxidis, and Giorgos Provias. This trio was a very popular and regular staple at the venues where Giorgos Zabetas, Kazandzidis and many others appeared. 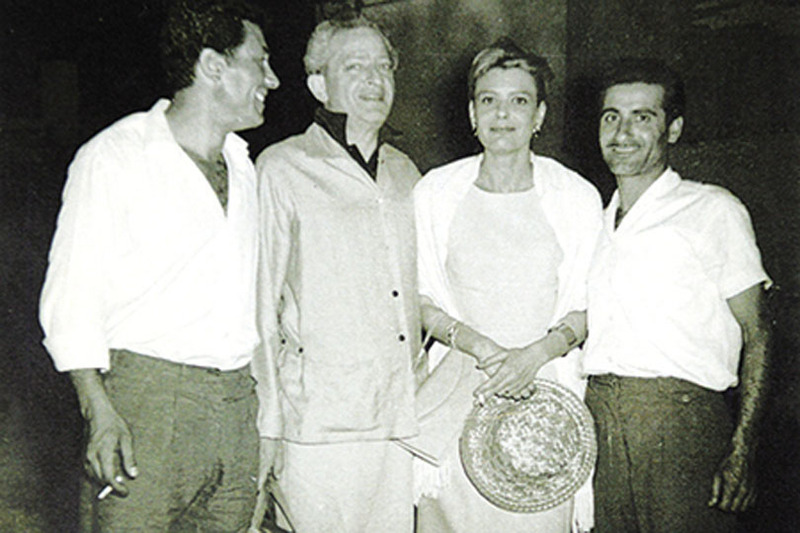 ABOUT THE PHOTO: From left to right: Giorgos Provias, Jules Dassin, Melina Merkouri, and Theodoros Kalpaxidis. Giorgos Provias was one of the three dancers mentioned above, and also the choreographer for the dance scenes in this film. Jules Dassin was the director, the writer, and the lead actor for Never on Sunday. Melina Merkouri was the actress/singer who starred in this film. Theodoros Kalpaxidis was one of the dancers mentioned above. This photo was taken at Cannes in 1960. As mentioned above, Melina Merkouri along with others visited the venue where Zabetas was playing. These three dancers just happened to be at the right place at the right time! This infamous trio was immediately booked to travel to Cannes to attend the ceremonies and liven up the party with their hot blooded Greek kefi! However, there is rumor that only two of them attended. They taught the hasapiko and other popular dances to the rich and famous. 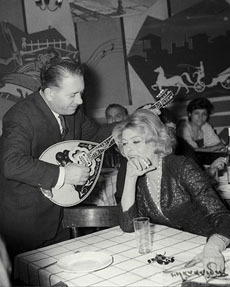 ABOUT THE PHOTO: Bazouki player Giorgos Zabetas serenades Melina Merkouri. Following success of the motion and picture and its Oscar-winning song, artists all over the world have recorded their own versions of "Ta Pedia Tou Pirea". The overwhelming majority of these were released under the title "Never on Sunday", so many people mistakenly believe that was the original name of the song. Lyricist Billy Towne created an English-language version to broaden the worldwide appeal. As of 2016, digital music download sites feature over 600 recordings of this song. This section was added by Shira. A folk dance club I used to belong to did the same dance steps to "Ta Pedia Tou Pirea" as they did to the song "Misirlou". These steps were in a dance style known as syrtos. It was only years later that I discovered that is the incorrect folk dance to do with this song. The correct dance style for this song would be hasapiko. Also, I have seen belly dancers incorporate this song into their sets, which is not something I would recommend unless their intent is to end their set with audience participation line dancing as they leave the stage. In the minds of Greek audience members, "Ta Pedia Tou Pirea" doesn't fit with tsiftetelli (belly dancing). As a Greek woman, I am proud that my country found great success and international film and music recognition. I am saddened that it took a film that exoticized a Greek prostitute in that way, to bring attention to a beautiful country with such rich history. My personal library of books, magazines, videos and cds. ABOUT THE PHOTO: From left to right: Giorgos Provias, Melina Merkouri, Theodoros Kalpaxidis, and one of the wealthy patrons attending the Cannes film festival. Giorgos Provias was one of the three dancers mentioned above, and also the choreographer for the dance scenes in this film. Melina Merkouri was the actress/singer who starred in this film. Theodoros Kalpaxidis was one of the dancers mentioned above. Giorgos and Theodoros were famous dancers, recruited to accompany the cast and directors to Cannes in order to bring life to the party and help present the Greek cultural entertainment. This photo was taken in Cannes in 1960. Ta Pedia Tou Pirea. Translation by Panayiota Bakis Mohieddin of the lyrics into English.